Novomatic’s Super 5 is a very run-of-the-mill slot game. It’s pretty new but the graphics and the style of the slot could fool you into thinking it was made many, many years ago. Part of the retro feel of the slot is thanks to the block colours, the simplistic logo and the unembellished symbols. Everyone loves a good slot game. It’s no mystery why slot games are the world’s favourite type of game to play at the casino. From Las Vegas to London to the World Wide Web, slot games are loved by gamblers at both brick-and-mortar casinos and online casinos. Slot games also give the most amount of choice! 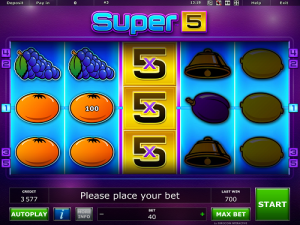 Super 5 is one of the more traditional slot games, with symbols like fruits and stars and bells. However, slot games come in all shapes and sizes! Novomatic make slots that celebrate all sorts of different themes, from sports, animals and fruits, to magical creatures, ancient civilisations and international cultures. In addition to Super 5, some of their most famous slots include: Book of Ra Deluxe, Mermaid’s Pearl and Lucky Lady’s Charm. Super 5 has 5 reels, 5 paylines and a special feature that multiplies wins by x5! This is a Eurocoin slot so it has all of the things you’d expect of a Novomatic slot game but the style is slightly different. Any novice slots player will do well to choose Super 5. There’s nothing much complicated about this slot so it’s not hard to play or understand. Play Super 5 here at NovomaticCasino.co.uk for fun. In Super 5 slot game, there are 10 unique symbols. The Super 5 symbol is special and the other symbols are rather ordinary. With 5 matches across a payline, the cherries, lemons, plums and oranges pay out 10 times your bet! 5 of the grapes or the gold bell will pay out 15 times your bet. The watermelon and the red seven will pay out 35 times your bet when you spin 5 across a payline. The star of the show is the gold star and 5 gold stars will pay an extraordinary win equal to 500 times your bet per spin! All of these symbols give smaller payouts for 4 and 3 matches as well. The great thing about these smaller wins is that the payline pay both ways, so you can match 3 or 4 symbols from the left or from the right and you will still get paid! Payouts are only awarded for consecutive matches (one matching symbol per reel on adjacent reels) on paylines). The 5 paylines are fixed and can’t be deactivated, so you’ll always bet on these 5 paylines. Your payouts in Super 5 can’t be gambled as this Novomatic slot game doesn’t have this feature. The paytable explains all of the rules and displays payouts correct for your bet. You can play Super 5 in autoplay mode. Although Super 5 is a no-frills slot game, it does have a special feature that makes things a little more exciting than if this were just a standard 5-line 5-reel slot game. The Super 5 feature can happen on any spin! In addition to the 9 ordinary symbols, the Super 5 symbol also appears on the reels. This is a black 5 on a bright yellow background. It’s very easy to spot and it behaves like a Wild symbol. But not just any Wild symbol. Yes, it can step in and perform its special substituting duties for any symbol, but it will also multiply any win it completes by 5! On any spin, this unexpected symbol may appear stacked on the middle reel! If the other symbols land in such a way that the Super 5 can substitute and award a win, it will, and any wins will be paid x5. If the other symbols land in such a way that it can’t make any substitutions, the game will pay you a conciliatory win.